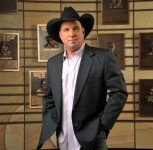 The official word is out; Garth Brooks five consecutive concerts in Dublin, Ireland at the end of this month have been cancelled. In a statement released today Garth’s team confirmed that the 18 semi’s loaded with all their production gear and stage rigging are currently on a ship heading home. Details about how to get refunds for the nearly 400,000 tickets that were already sold will be issued by Ticketmaster tomorrow morning. In other news, the first concert of Garth’s comeback tour is expected to be held in Chicago, with full details on that coming from Camp Garth tomorrow as well.